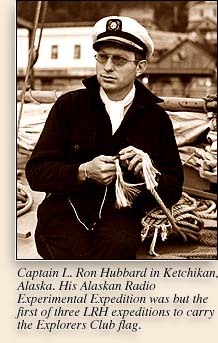 L. Ron Hubbard first carried the flag aboard a thirty-two-foot ketch on his 1940 Alaskan Radio Experimental Expedition [see RON The Master Mariner: Yachtsman]. As the title implies, the voyage called for the testing of a then novel radio navigation device between Puget Sound and the Alaskan panhandle, and, factually, played no insignificant role in the development of the LORAN (LOng RAnge Navigation) system. Also pertinent to the two-thousand-mile voyage was Rons recharting of an especially treacherous Inside Passage on behalf of the United States Navy Hydrographic Office, and his ethnological study of indigenous Aleut and Haidas. As a further word on the latter, it might be noted L. Ron Hubbard was among the first after Franz Boas to examine the mythological heritage of the north coast Indian tribes and was primarily known within exploratory circles as an ethnologist. Not so well known, but nonetheless worth a mention were the less official ends of the voyage on behalf of the United States Navy. Specifically, Ron was to photograph all coves and channels capable of harboring enemy submarines, and thence make his way to the Kuril Islands photographing Japanese warships. Along the way, he not only captured an enemy spy and roped a Kodiak bear, but braved seventy-mile-an-hour winds and commensurate seas off the Aleutianshence, the tattered condition of his first Explorers Club flag number 105. Presented here, however, is a lighter side of far-flung exploration (if no less easy on the stomach). By way of background, let us reiterate that Explorers Club banquets are unique affairs. Traditionally described as safari dinners, main courses tend to range from the truly exotic to the outright bizarre. In addition to those mammoth steaks exhumed from primeval glaciers, for example, salads were said to have included undigested grass found in the mammoths belly. Then there was roughriding United States senator Barry Goldwaters Peggys Frijoles, American astronaut John Glenns muffins and ham loaf, followed by locust cakes, lamprey casserole and yellow jacket soup to name but a few delectable items found in The Explorers Cookbook: An International Potpourri of Recipes and Tales from World Adventurers. Many cookbooks are prefaced by statements claiming laboratory testing, home kitchen testing, standard measurements and all that sort of thing. Not this cookbook! Whether Ron himself actually tasted and tested his own contributions is a question the reader must decide for himself. But in either case, the Explorers Club advice holds true: this is the real stuff, and only for those with adventurous spirits and stomachs to match. From his various Caribbean voyages comes Iguana à Rotisserie on a broad leaf. From his upcoming North African/Mediterranean expedition comes his charred sheeps head (replete with eye), and his small white snails with licorice. Also included here is Rons own introductory bon appétit.